Almost half of Republicans think an armed revolution may be needed soon. What does it mean for guns and democracy? There's plenty of proof of an authoritarian streak and animus toward democratic ideals in today's conservative movement. There was the movement's use of its judicial power to halt a vote recount and instead install a president who had lost the popular vote. There is the ongoing GOP effort to make it more difficult for people to cast a vote in an election. There is the GOP's record use of the Senate filibuster to kill legislation that the vast majority of the country supports. There is a GOP leader's declaration that what the American people want from their government simply "doesn't matter." Up until today, you might have been able to write all that anti-democratic pathology off as one infecting only the Republican Party's politicians and institutional leadership, but not its rank-and-file voters. But then this morning Fairleigh Dickinson University released this gun control-related poll showing that authoritarianism runs throughout the entire party. Take a look at the cross-tabs on page 3 of the national survey. 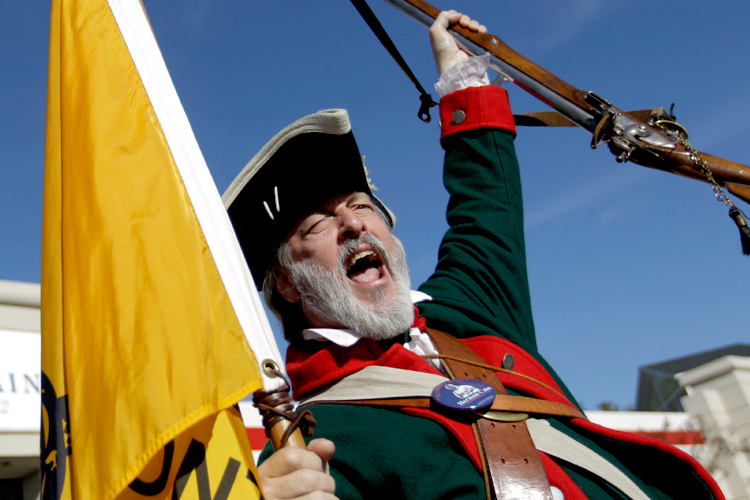 That's right, you are reading it correctly: Almost half (44 percent) of all self-described Republican voters say they believe "an armed revolution might be necessary to protect our liberties." Just as bad, more Republicans believe an armed revolution might be necessary than believe one isn't necessary. This poll raises two obvious questions, each more disturbing than the next. The first question is about gun control and gun ownership, and more specifically, what the latter is all about. Typically, GOP leaders say that their opposition to minimal gun regulations has nothing to do with helping arm those who want to commit acts of violence, and everything to do with wanting to make sure people can defend themselves. Based on the poll, of course, it is certainly likely that many are buying such weapons in an effort to defend themselves, both for day-to-day life and in the event of a sudden armed revolution. But here's the scary part: How many are buying weapons to arm themselves in order to foment an armed revolution? Maybe none, but maybe a lot. I don't have an answer, but this poll suggests the question should at least be aired. The other question is about republican democracy: Can it survive in an age when almost one-half of one of the major parties seems to support the concept of violently thwarting it? "Politics is war by other means": That aphorism sums up the democratic theory undergirding the American idea for two centuries. Though we haven't always lived up to that ideal, it is a pretty simple one: A civilized society should solve disputes through a democratic process and democratic institutions, rather than through the barrel of a gun. And while our democracy has been corrupted by Big Money, it still functions better than autocracy. In that sense, Churchill had it right when he said "democracy is the worst form of government, except for all the others." Incredibly, though, almost half of Republicans don't seem to necessarily see it that way. According to the Fairleigh Dickinson poll, 44 percent of rank-and-file Republicans seem to believe that because they aren't getting their way through the ballot box, bloodshed may be justified to impose their will on everyone else. Think of it as sore loser-ism juiced by violence. Of course, GOP apologists will say that the poll just asked specifically about armed revolution "to protect liberties," the idea being that almost half of Republican voters don't support using violence to advance their own political agenda, they only support it in the face of a future dystopian nightmare whereby the population is terrorized by police-administered drone bombings and Waco-esque invasions of private homes. But that's the thing: We can't be so sure that's really true when conservative media voices and politicians are using the broad and incendiary language they now regularly employ. Today, those voices often claim that almost everything in the Democratic/liberal agenda -- from Obamacare to taxes to environmental regulations to contraception policy -- is an assault on "liberty." That means the poll might indicate something much more significant than understandable opposition to Big Brother turning our country into Oceania. It might show us that all the vitriolic language employed by the right is undermining the most basic nonviolent democratic ideals that are supposed to define America.